Oh no. Do you think that brother in the back is taking copious notes, or has he tuned me out completely so he can jot down a journal entry? Please tell me the sea of iPads out there are all opened up to the LDS scripture app and they are avidly following along. Wait…is that Sudoku? Are the more senior members pondering the word, or somehow napping in cold, metal folding chairs? To be fair, I knew it was dicey to dim the lights for my Power Point slides. Before being called as a Gospel Doctrine Teacher, I taught Sunday School to a cluster of 16 year olds married to their cell phones. It was a challenge to get meaningful conversations underway, but fun-sized candy bars managed to break the ice just enough to get the ball rolling. Somehow I doubt blurting “look alive!” while I overhand a Snickers bar to the more emeritus members of the ward would have the same effect. No, the adult crowd is trickier, more finicky. Their gospel knowledge is profound so they want someone to offer unique insight, come at it from a different angle, not regurgitate the same old-same old. Unlike teenagers, their questions are few. Like teenagers, they bore easily. So what’s a Gospel Doctrine teacher to do? Study. Pray. Mull over the lesson and assigned passages for days. Weeks even! We teachers consult other church manuals, pore over the thoughtful blogs of our fellow teachers from around the world, and scour the back issues of the Ensign. We agonize over which questions will spark a lively discussion without derailing the class. Our next lesson is the lens through which we see and hear all. New ideas bubble and percolate to the top of our consciousness throughout the entire week, until the closing prayer is said. Then we go home, read through the next lesson and it starts all over again. It’s awesome. For months I used to wonder if my efforts were at all appreciated. Is anybody besides the same four loyal hand-raisers even listening? Then one day that brother in the back approached me to say he was really enjoying Sunday School lately. So much so that he hadn’t written in his journal for weeks! Is there a higher compliment than that? But it’s ironic really. This week’s lesson is on the importance of keeping a personal history. I've never been one to thoroughly love Gospel Doctrine, but the past year I've realized that you get out of it what you put into it. I love studying about the Book of Mormon. 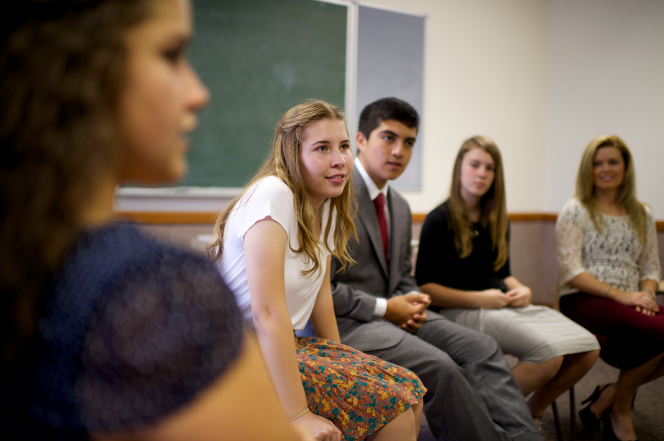 I have loved seeing my testimony of the Book of Mormon grow and I love the comments and insight that is shared by the teachers and the other members. Honor and respect to our diligent Sunday School teachers who seek to make their lessons informative and interesting.